You arrive at the scene of a crash where someone is bleeding heavily from a wound in their arm. Nothing is embedded in the wound. What could you do to help? You arrive at the scene of a crash where someone is bleeding heavily from a wound in their arm. Nothing is embedded in the wound. What could you do to help? This article covers everything you need to know if you have an accident or if you come across an accident including how to deal with injured people, what do to with your vehicle, what details you should exchange and more. 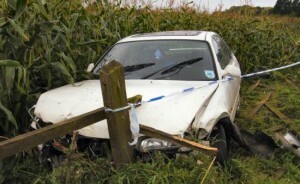 If you are the first to arrive at a crash scene the first concerns are risk of further collision and fire. Turn off the engines of other vehicle if possible, but be aware of unexploded airbags because they can go off and injure you. Turn on vehicles’ hazard warning lights, then contact emergency services. It’s important that people at the scene of a collision do not create further risk to themselves or others by staying away from the flow of traffic, particularly if it is on a motorway or major road, as traffic will be approaching at speed. Do not put yourself at risk when trying to help casualties or warning other road users. This also includes being careful of leaking fuels and hazardous materials. Move all uninjured people and people with minor injuries away from the scene if it’s not safe to leave them in their vehicles. Try to keep injured people warm and comfortable. Ensure that no one smokes anywhere near the scene as there could be leaking fuel or other hazardous materials. If hazardous materials are present, position people upwind so that any fumes are carried in the opposite direction. If possible send a person each way up the road to place a hazard warning triangle at least 45m before the accident to warn other road users. If you are driving a vehicle carrying passengers, for example a bus or coach, inform the passengers what the delay is without upsetting them. If there’s a risk of being hit from behind you can move the passengers to the front of the bus. Accidents in tunnels can create extra difficulties because they are likely to block the carriageway and there will most likely be no way to move vehicles off the road. Look out for variable warning signs. If you come across a vehicle on fire in a tunnel, stop, put on your hazard warning lights, and if you can find a fire extinguisher, try to put out the fire. Don’t use a water (red) fire extinguisher on flammable liquids as it can spread the fire further. Be careful of smoke inhalation, and don’t open the bonnet. Call the fire brigade if you know that you won’t be able to put out the fire. If your car, motorbike or lorry breaks down in a tunnel, put your hazard warning lights on then call for help from an emergency telephone point. Don’t assume that you can be seen on CCTV cameras, or that a police vehicle will spot you. It’s important you alert emergency services quickly. If your vehicle catches fire in a tunnel it’s usually best to try to drive it out of the tunnel and off the road, unless you’re putting yourself in danger. Minimise your chances of having an accident in a tunnel by removing your sunglasses and switching on your dipped headlights. If traffic is moving slowly, keep a safe distance from the vehicle in front. You will also need to know the height of your vehicle before you enter a tunnel or go under a bridge so that you don’t get wedged underneath. If no height is shown, then there is at least 5m headroom. There are about 800 incidents a year where vehicles or their loads hit railway or other bridges. If you hit a railway bridge you must report it immediately to the railway authority in case it has damaged the bridge and could cause a train to derail. 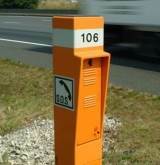 You can use the hard shoulder to stop after an accident on a motorway. Park as far to the left as possible to keep your vehicle away from the traffic flow. If it’s not possible to park over to the left, you might need to exit your vehicle through the passenger door if possible, so as not to put yourself in danger of being hit by another vehicle. If you are in a lane and have to warn someone that you have had to stop or slow down, use your hazard lights. To find the nearest emergency phone, follow the arrows on the marker posts. They are spaced every 100m. It can be better to use a roadside emergency phone rather than you mobile phone if you don’t know where you are because each phone has its own number and emergency services will know exactly where that is when you call and give them the number. If you are driving on the motorway at speed and you notice traffic has stopped up ahead you can use your hazard warning lights to warn drivers behind you. Brake early and gently. Pump the brakes also to alert drivers behind you. Similarly, if you see a vehicle ahead of you on the motorway with its hazard lights on, it could be signalling that there is stationary traffic up ahead. Even if it’s not in your lane, you should be prepared to slow down because traffic could get caught out and dive across into your lane to avoid running into the back of stopped traffic. 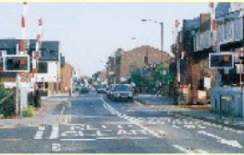 You should always stop if the red lights are flashing as you approach a level crossing. If not, the train might collide with you, or you might collide with any barrier that’s coming down. You will know when the red lights are about to start because an amber light will show first. If your vehicle breaks down on a level crossing and the lights have not yet begun to flash your first priority is to get everyone out of the vehicle and clear of the crossing. Then use the railway telephone, if there is one, to tell the signal operator. If you have time before the train arrives, move the vehicle clear of the crossing, but only do this if alarm signals are not on. If you have a motorbike you can push your bike out of the way – be careful you don’t get your wheels caught in the tracks. If you have a manual vehicle, but it won’t start, try putting it in first gear (or reverse – whichever direction is shorter), releasing the handbrake, and turning the ignition on. The starter motor and battery might have enough power to move the vehicle clear of the crossing. If you have a breakdown or accident on a level crossing and bells have started ringing, get everyone out of the vehicle and well clear of the tracks, in the same direction that the train is coming from. This ensures that if the train hits the vehicle that it doesn’t propel it into you. If you arrive at the scene of an accident, don’t touch any casualties who are in contact with live electricity. If there are power lines over the vehicle take extreme care. You should use a dry non-conducting item, such as a wooden sweeping brush or plastic spade. You must not give first aid until you are sure the electrical contact has been broken. If you are driving a passenger vehicle and you notice smoke coming from the engine compartment you need to act quickly. Smoke from the engine compartment is very serious, as fire within a vehicle can spread very quickly. Your first priority is to make sure that all passengers get off the bus as quickly and safely as possible and away from the bus. If you are in a tunnel, move them towards the nearest exit. You should carry a warning triangle, first aid kit and fire extinguisher in your vehicle so that you can help with emergencies. On a road it might be possible for you to stop with your hazard lights on and remove an obstacle from the road, but you should never attempt to stop and move an object on the motorway yourself; always call for help from an emergency telephone. 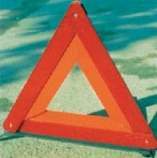 If you know that something has fallen from your car, motorbike or lorry, pull over at the next emergency telephone and call in the hazard. The operator will know the location of the phone because they will ask you for its number (which will be on the phone) and can dispatch emergency services to retrieve it. The operator will also ask for your details and whether you belong to a motoring organisation. If you see an object fall from a vehicle, for example something falling off a roof rack or trailer, then you should stop at the next emergency telephone and report the hazard. Don’t try to catch up with the driver. If you remember the licence plate then you can give that to the operator. Drivers of large vehicles such as lorries often won’t be able to tell if something has fallen from their lorry. Don’t walk back up the motorway and try to wave traffic down as this will just distract drivers from the road and make it more likely that they will hit the obstacle. A tyre blowout can be caused by hitting a sharp object on the road, a weakness in the tyre sidewall, over-inflation, under-inflation that causes overheating, delamination through wear, or simply wearing through the tyre. A blowout is where pressure is lost instantly, whereas a puncture could lose air over several days and therefore be less noticeable initially. If you notice a rhythmic throbbing which changes with speed, you could have a nail in your tyre. If you notice the vehicle pulling to one side more than usual you could have a slow puncture. A front tyre blowout in a car, van or lorry will cause the vehicle to pull towards the side of the blowout. This is because the rolling resistance of the wheel is dramatically increased – i.e. it takes more energy to turn it, therefore it’s like braking on one side. Don’t use heavy braking because it could cause you to spin. Hold the steering wheel firmly, take your foot off the accelerator and let the vehicle coast down to around 20mph, then apply progressive braking until you have stopped. If you have to steer across multiple lanes of traffic take extra care. If the blowout is on the left-hand side of your vehicle don’t park hard up against a wall or fence otherwise you won’t be able to change it, unless the only way to get your vehicle out of the traffic flow is to park this far left. In this case you will have to call emergency services to help you. If you are riding a motorbike, move your weight more over the back wheel, close the throttle and let the bike coast to a stop. Be ready to use your feet as outriggers if you need to stay stable. Keep a firm grip on the handlebars. If the rear tyre blows out on a single-axle, single-tyred vehicle, it’s likely that the back end of the vehicle will first swing towards the side of the blowout, then swing back, creating a fishtail motion. Overcorrecting at this point could lead to a spin. If you have electronic stability control in your vehicle, the electronics should keep you from skidding and you will be able to apply more braking force than you would without it. If the rear tyre blows on your motorbike keep your weight neutral and let the bike coast to a stop. If the rear tyre blows on a vehicle with a tandem or tri-axle or one with four or more tyres per axle, the lorry, bus or large van is unlikely to spin. However, the tyre itself could cause a hazard and hit another vehicle if it comes apart completely. Stop as soon as you can on the side of the road. This video from America shows a tyre hitting a vehicle’s bonnet, which caused a large dent. The vehicle was tailgating an SUV ahead and therefore didn’t have a good view of what was on the road – using the 2-second rule could have helped here. A casualty has an injured arm. They can move it freely but it is bleeding. You should get them to keep it in a raised position to help reduce the blood flow. They can also apply pressure using a thick, folded cloth. Make sure the limb isn’t broken before you move it. If a collision has just happened and an injured person is lying in a busy road the first thing you should do to help is warn other traffic. The most immediate danger is further collisions and fire. You could warn other traffic by displaying an advance warning triangle or sign (but not on a motorway), switching on hazard warning lights or by any other means that does not put you or others at risk. If you suspect a casualty has back injuries, don’t attempt to move them unless they are in immediate danger as this could cause further injury. Call an ambulance as soon as possible and keep talking to them to keep them calm. If casualties can remain in their vehicles without their being any danger, this is usually the safest as there’s shelter and if they stay where they are, any disorientation can be dealt with easily by emergency services or other people on the scene. Don’t offer injured people anything to eat or drink as they could have internal injuries which are not apparent. If a casualty is not breathing normally chest compressions should be given at about 100bpm, which is the same tempo as ‘Stayin’ Alive’ by the Bee Gees. You can see a demonstration in this video here. This helps to maintain circulation. Place two hands on the centre of the chest and press down about 4-5 centimetres, at the rate of 100 per minute. If a casualty stops breathing unblocking the airway and gently tilting the head back will help the casualty to breathe. They will then be in the correct position if mouth-to-mouth resuscitation is required. However, it’s recommended you don’t use mouth-to-mouth resuscitation unless you know what you are doing. Check they haven’t swallowed their tongue by reaching into their mouth with your finger. Don’t move a casualty unless there’s further danger. If a young child has stopped breathing, first check that the airway is clear. Then give compressions to the chest using one hand (two fingers for an infant) and begin mouth to mouth resuscitation (if you know how to do it). Breathe very gently and continue the procedure until they can breathe without help. If a person has suffered a burn, the burn needs to be cooled. It should be cooled for a minimum of ten minutes. Use a clean, cold non-toxic liquid preferably water. Bear in mind the person may also be in shock. Don’t remove anything sticking to the burn – cool the burn as much as possible. If a person is unconscious in their vehicle you should call emergency services as soon as possible as they could have serious injuries that aren’t immediately apparent. Remember DR ABC – Danger Response: Airways, Breathing, Compressions. Check that their airway is clear by tilting the head back gently and unblock it if necessary. Then make sure they are breathing. If there is bleeding, stem the flow by placing clean material over any wounds but without pressing on any objects in the wound. Compressions may need to be given to maintain circulation. If you have placed a person in the recovery position and they are unconscious but breathing normally, check their airway is clear. Don’t leave them alone until medical help arrives, and don’t move them unless it’s absolutely necessary. If a driver is suffering shock, talk to them calmly and have them respond to you. Don’t leave them. They could have an injury that’s not immediately obvious. Signs of being in shock sweating, rapid pulse, shallow breathing and pale grey skin. Emergency services will take over once they arrive. You can help minimise the effects by laying them down, loosening tight clothing and checking their breathing and pulse. If a person becomes hysterical you can help calm them by talking quietly and firmly to them. If an injured motorcyclist is lying in the road you should always seek medical help. You should only remove the motorcyclist’s helmet if they are in danger of choking, or they are not breathing. If you have to remove their helmet, have someone support their head and pull the helmet off gently from the back. Use the engine cut-out switch to stop the engine. This switch is usually red and on the right-hand handgrip. If you come across a motorbike accident and the motorcyclist is lying in the middle of the road, unconscious, your first priority is to make sure other vehicle are aware to avoid further collisions. If you see a vehicle on the side of the road with a HELP pennant displayed, this means the driver is most likely a disabled driver. If a tanker is involved in a collision look for signs on the side and back which indicate what type of dangerous goods it is carrying. You can tell emergency services when you call them. If there’s a plain orange rectangle anywhere on the vehicle it is likely to be carrying hazardous goods. Drivers who carry hazardous goods must have training in using fire-fighting equipment. There should be fire-fighting equipment on the vehicle. A driver has to renew their certification to drive with hazardous goods every 5 years. If you have had a collision with another moving vehicle and someone is injured and your vehicle is damaged you must stop and find out whether the other driver owns the other vehicle involved; their name, address and telephone number; the make and registration of the other vehicle; and the details of the other driver’s vehicle insurance. If you are involved in a collision that results in injury or damage you must stop. The police might ask you to provide your driving licence, insurance certificate and MOT test certificate. If you are involved in an accident which causes damage, and no one else is around, for example you hit someone’s wall, then you must report it to police within 24 hours. Accidents take your vehicle off the road, and if you use it to make money, it means you can’t make money. Signal for at least three seconds and check your blind spots every time you make a maneouvre. If riding a motorbike, position yourself on the road so that other vehicles can see you and you are not driving in their blind spots, and always assume that if a vehicle can move into your lane, that it might.